The recipients were Elijah Stone, Christopher Howell, Rachel Bartlett, and Scott Vales. Each received a $500 scholarship to help them with any college expenses based on need. This was the first time Eagle Community Credit Union offered this scholarship. A majority of the funds were donated by credit union members via a membership fundraising campaign held from Veterans Day through December 31, 2016. 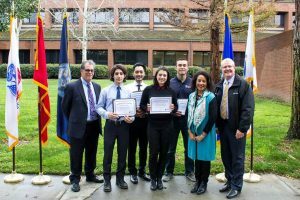 “We’d like to thank our team members for spreading the word about this, as well as Karla Davis and Marcus Bowman in the Business Development Department for spearheading this program and offering financial assistance to the veterans in the Veterans Program at Irvine Valley College,” said Eagle Community CU CEO Scott Rains. The credit union aims to offer this scholarship program again and it expand its reach to more student veterans at other local community colleges. Eagle Community Credit Union is a not-for-profit financial cooperative that offers personalized service and value-oriented financial tools to more than 20,000 members.